What can we learn from alleged errors and inconsistencies in the Bible? Why does God allow anything to be questionable or seemingly contradictory? Apparent contradictions can teach us a lot about God, Satan—and ourselves. Many people today have been told that the Bible is hopelessly riddled with contradictions. It isn’t, as other articles in this “Is the Bible True?” section prove. But why is there even any doubt? Why didn’t God make the Bible so clear and unassailable that no one could question it? What kind of God would allow people today to question the wisdom that had been treasured by people for thousands of years? First of all, One who has given us free will and is patient with us. Also One who places high value on truth and on our learning to recognize the truth. God wants people to seek truth, search for wisdom and diligently study the Bible (Proverbs 23:23; 4:7; 2 Timothy 2:15). The Bible is not an easy book. But the vast majority of so-called contradictions are not mysterious and can be sorted out by carefully reading and comparing scriptures, translations and historical background. It takes work, but so does any knowledge that truly matters. What kind of God allows errors to creep into copies and translations? One who is willing to work through fallible human beings. The copyists of the Bible were some of the most careful scribes, and the rules involved in copying were stringent. But in spite of the best quality control, humans are still, well, human. We make mistakes. One source estimates that there are about 1,500 errors (typos, if you will) that crept into the Old Testament. Out of the 23,145 verses and more than half million words in the Old Testament, that is a very small number, and most of those are simple spelling errors that do not affect the meaning. 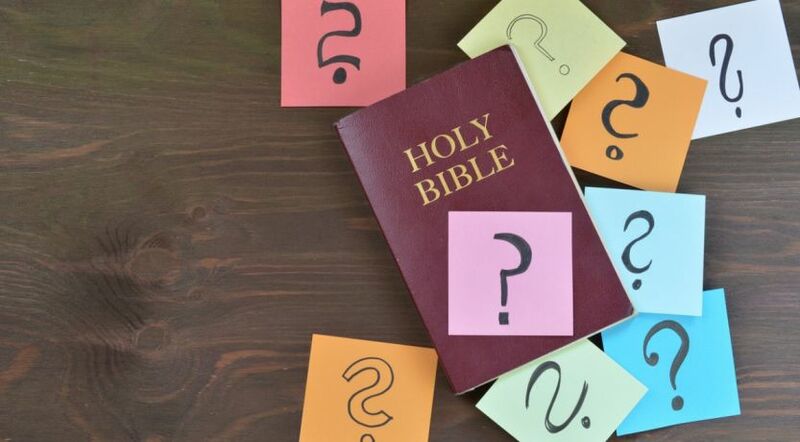 For more about the accuracy of the copying and translation of the Bible, see our articles “Old Testament,” “Contradictions in the Bible?” and “What Is the Most Accurate Bible Translation?” and download our booklet Is the Bible True? What kind of God allows some people to understand and others to scoff? What kind of God would use 40 different people over 1,500 years to record His book—with the exponential risk of errors and contradictions that entails? Who would try to deceive people into not trusting the Bible or God? “‘You will not surely die. For God knows that in the day you eat of it your eyes will be opened, and you will be like God, knowing good and evil” (Genesis 3:4-5). The deceiver lied and asserted that God was holding out on them. He insinuated that God is a liar. Eve’s experiment could not discover the spiritual answer. The physical facts she considered seemed to back up Satan’s story. And so she ate, and so did Adam. And that sin led to their deaths as God had said. Jesus said that Satan “was a murderer from the beginning, and does not stand in the truth, because there is no truth in him. When he speaks a lie, he speaks from his own resources, for he is a liar and the father of it” (John 8:44). The Bible tells us the world is under Satan’s sway, and that he deceives the whole world (1 John 5:19; Revelation 12:9). Have we fixated on minor copying and translation problems that we would overlook in other ancient literature? If so, why? Perhaps because the Bible claims inspiration, so we hold it to a higher standard. This is good, but we need to recognize that the Bible doesn’t claim that it will have no scribal errors or translation errors in any language. We don’t have the original autographs, and most of us don’t read Hebrew, Aramaic and Greek. So we have to use imperfect translations. Have we bought into today’s generally accepted belief that the Bible is full of contradictions? Still, the Bible is extremely accurate and attested to by a great number of ancient manuscripts, far more than most ancient literature. For comparison, the earliest copies we have today of Herodotus are from A.D. 900, more than 1,300 years after he wrote. And there are only eight ancient copies. On the other hand, the earliest New Testament copies are from only about 30 years after the New Testament was finished, and there are thousands of ancient Greek manuscripts. Have we bought into today’s generally accepted belief that the Bible is full of contradictions? Have we checked out at least a few of these “contradictions” to see whether these things are so? If not, it could mean we are trusting those who make these claims, that we are at least somewhat swayed by public opinion, or that we don’t think it is important enough to check. Dr. Collett concluded the account, “His knowledge of what the Bible was supposed to contain was all second-hand! He neither knew its supposed errors, nor its precious truths” (p. 115). There are other reasons, of course. If we aren’t trusting others, but haven’t yet proved the truth of the Bible for ourselves, it could mean that we aren’t sure where to start to check. The linked resources in this article are good places to start, especially the free booklet Is the Bible True? The answer is too important to just assume or to trust to others. It is not impossible, and it doesn’t require a graduate degree. Take the time and effort to study and prove it to yourself. The answer can make all the difference for your life and future. The Creator of the universe recorded the Bible as a message for you—don’t ignore it!